Casio for the month of July. Lots of colours. I like these. The 2 G-8100 certainly stand out, so does the yellow GWs. 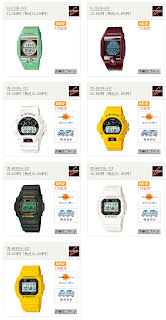 gshock at PIJ. Before i purchase this, i haven't seen any review on it. I am looking forward that the author will put some in here.